The Theremini's take on an old theme makes for a fun and interesting package. Fully-featured Theremin functionality. Pitch correction. MIDI and CV connectivity. No way of editing the built-in sounds. In the current climate where online auctions and small ads are adorned with the words 'vintage' and 'classic' with little regard for their true applicability, we find ourselves sitting in front of a piece of kit that can genuinely lay claim to a heritage that goes back further than most - the Moog Theremini. And it is built by a company that was one of the first to commercialise electronic musical instruments and take them out of the realms of the experimental and into popular music in a big way. "The unit on review is in effect a proximity controlled synthesizer"
This isn't Moog's first foray into the world of the Theremin. 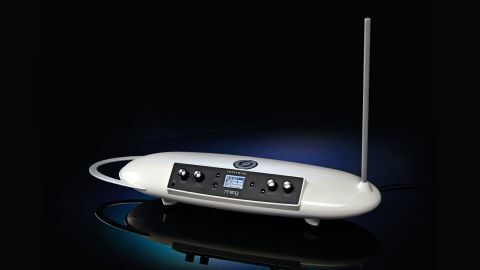 The Theremini is the third arrival in this subset of the Moog family, joining the Etherwave and Etherwave Plus. Like both of the earlier units (and their original forebears) the unit on review is in effect a proximity controlled synthesizer. In other words, you use body movement to control the pitch and volume (and sometimes timbre) of the instrument. This is traditionally achieved by harnessing the so-called heterodyning effect, where the frequency of one of a pair radio-frequency oscillators is varied by proximity-related changes in capacitance. The difference in these two frequencies (the beat frequency) sits in the audible range and this is then output to a loudspeaker. The classic Theremin sound can be heard on many early horror/sci-fi movies, though it has uses far wider than that. On opening the box of the Theremini you are presented with a retro-futurist glossy white lozenge with a rectangular black control section. To get started you need to unclip the 'aerial' from the underside of the unit and insert it into the hole on top. Power comes from the supplied external adaptor. Given that Theremins respond to the proximity of objects, it's no surprise to find that the first thing you need to do on powering up is to run through the calibration procedure. Although this is a somewhat elaborate affair (even in comparison to some analogue synths) you are guided through the process with clear instructions on the panel's backlit LCD display. One final step worthy of attention is the Note Range setting - smaller ranges make it easier for you to achieve the correct note when starting out. However, as we shall see, there are ways of making this even easier. "When you're ready to play it's as simple as choosing a synth preset and waving your hands around"
Now we're ready to play, and this is as simple as choosing a synth preset and waving your hands around. Unfortunately, you notice pretty quickly that the sound coming out of the small internal speaker (there are also two 1/4-inch output jacks on the rear panel and a small headphone socket on the front) is not quite as well intoned as you thought it might be. It's easy to see why they are great for special effects, as getting a decent pitch-perfect melody from airborne gesticulation takes plenty of practice. Despite its particularly old-school approach to playing the instrument, the Theremini's sound generation circuitry is distinctly digital. So, whilst most people associate Moog with analogue synthesis and processing, here they have channelled their expertise in developing iOS synth apps into a standalone form. In fact, you get 32 presets taken from their well-regarded Animoog app, which cover a range of timbral areas. These go from the classic pure tones you expect from a Theremin, where you have control over pitch and volume, to others where your left hand controls filter cutoff. Sadly there is no way of editing the built-in sounds (even via the USB interface) - and analogue purists will be somewhat disturbed - but you do get 31 more sound variations than most other Theremins! The fact that there's DSP capability inside the box means that it has been easy to add a stereo delay (in three flavours) to output, but more significant than this is the pitch indication display and the knob labelled Pitch Correction. The latter allows you to let the Theremini automatically turn your arm flailing into nicely measured pitch increments. Further options allow you to specify the root note and scale to which everything gets aligned. At first we balked at this function, as it does take you away from traditional Theremin territory, but it makes for greater flexibility and enjoyment. We mentioned the USB socket earlier, and things become clearer when you realise that it allows you to send MIDI CC data to your DAW. Both antennae can be configured to generate 7 or 14-bit value ranges for your choice of CC. On top of this, there is a nicely tweakable CV jack output, that can also come under the spell of the pitch correct process if you choose. The Theremini has clear limitations, but it does pack in some useful features that extend its flexibility. There might also be the possibility of extending the features and/or editing capabilities via USB in the future, though there is no specific word from Moog on this front. In terms of competition, it is possible to get a cheap and cheerful Theremin-like device relatively cheaply, but reliable and solidly playable units are rarely cheaper than a few hundred pounds. Overall this is a fun and interesting instrument that deserves your attention if you feel like escaping the shackles of pads, keyboards or mice.